Have you ever heard of the AlterG Anti-Gravity Treadmill? This unique piece of equipment enables individuals to walk or run at a lower percentage of their body weight. This is useful in the clinical setting as it can help patients perform rehabilitation with less pain. The AlterG Anti-Gravity Treadmill can be used with patients looking to gain mobility, strength, natural movement and fitness, while also minimizing stress on the body or on injury.2 This piece of equipment is particularly beneficial for injured athletes, as it can assist in gaining confidence, maintaining cardiovascular condition, retraining gait without compensations from pain or injury, as well as reduce the risk of re-injury. The AlterG Anti-Gravity Treadmill uses unloading and progressive loading to achieve the aforementioned benefits. The treadmill uses air pressure to help unweight the participant. Specific shorts are worn, generally over the top of shorts or tight leggings. The patient then steps inside the chamber of the machine, similar to a large bubble, and is zipped inside. This allows the lower body to be enclosed and supported by the air pressure. Once the machine has calibrated to the individual, the body support percentage can be adjusted as desired. From there, the treadmill operates like a regular treadmill with speed adjustments for walking or running. From a clinical perspective, the sides and back of the bubble are clear to allow the therapist to observe mobility and gait mechanics for better treatment. The patient continuously maintains contact with the treadmill belt and never floats within the machine. Who Benefits from the Alter G Anti-Gravity Treadmill? There has been research to support the use of body assisted support systems in rehabilitation for joint pain such as arthritis, or for returning to walk after surgery or conditions like stroke.1 This is because the AlterG Anti-Gravity Treadmill can be used to restore normal walking and running mechanics while also supporting the healing tissue.3 What’s more, the AlterG Anti-Gravity Treadmill can be used to assist in recovery from fractures, stress fractures, knee or hip surgery or replacement, as well as for weight loss.2 Overall, the use of this machine can help facilitate rehabilitation, improve recovery times and optimize rehab. 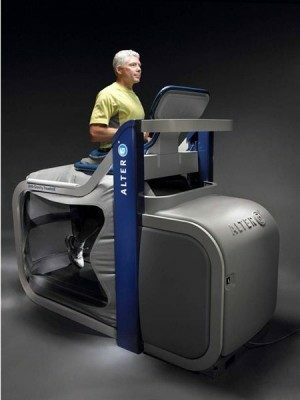 To learn more about the AlterG Anti-Gravity Treadmill or to find an Athletico clinic that offers this piece of equipment, click the button below. Peeler, Jason, et al. “Managing knee osteoarthritis: the effects of body weight supported physical activity on joint pain, function, and thigh muscle strength.” Clinical Journal of Sport Medicine6 (2015): 518-523. Chun, Jacon, et al. “Guidleines for using the AlterG Patients with Orthopedic Problems”. AlterG.com. Very informative! I have always considered buying an Anti-Gravity Treadmill for my outpatient clinic! We wish to purchase an anti gravity treadmill for our own personal use. Can you provide us with costs and warranty.